The Ford Fairlane was a full-size American car manufactured from 1955 through 1961, and then it was made into a mid-sized car, which was produced by the Ford Motor Company from around 1962 until 1971. The name of the Fairlane Cobra model comes from the Fairlane property of Henry Ford Lane directly. The V8 engine in the model range of this car took a different position. In 1955-1958 the most expensive model as well as equipped “Ford” was the Ford Fairlane. Since 1962, the name has been produced using a mid-sized car model by independent manufacturers within the compact Ford Falcon and Ford Galaxie and Ford Custom. The basic model engine type was offered with a 302-m block (5 hp) and a mechanical three-speed gearbox, optionally with 390 m (6.4 l) or 428 m (7 h.) Blocks. The Cobra had a standard 428 block (335 declared hp), as an option the rear axle with a ratio of 4.3: 1, separate seats, a clock, a tachometer, an air intake on the hood and disc brakes in front with a vacuum amplifier. In 1970, the 1969 Ford Fairlane Cobra became even larger, the wheelbase increased by one inch. On the “Cobra” appeared 429 block (360-370 claimed hp, depending on the installed heads of the unit). The Cobra Jet Ram Air 429 was offered with the Ram Air system (inertial air pressure from the air intake on the hood), and the Drag Pack. 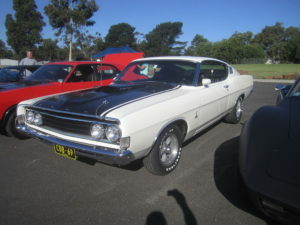 From the middle of the year, the so-called “Ford Falcon 1970 ½” was produced, which was a body of Fairlane with a minimal finish. For 1971, the names Falcon, Fairlane, ’69 Fairlane Cobra , and Fairlane 500 were abolished, all medium-sized “Ford” got the name Ford Torino. Part of the reason Classic Cars Online US exists is to help connect classic car buyers and sellers, and we’ve added several ways for you to connect – pick your favorite, or join us in all four places: (1) sign up on the Classifieds page here on the site, (2) visit and like this site’s Facebook page, (3) the Best Classic Cars for Sale Online page or (4) join the Classic Cars Online: Classic Cars for Sale group if you are looking to buy or sell classic Ford muscle cars.